We all receive so many holiday emails each year. Do you open all of yours? For most of us, the answer is “no,” because there is simply too much clutter in our inbox. We receive daily messages from friends, family, business partners and brands. With IndiVideo, our interactive personalized video platform, our clients can better engage prospects and dramatically improve their brand’s digital performance. To prove just how effective personalized video can be for email marketing, we leveraged IndiVideo in our own holiday campaign — and saw amazing results. We know interactive personalized video is a powerful tool for creating engagement and conversions. This year, we added some fun new features to further personalize the experience. We gave recipients the ability to input text into the video in real-time, and we used robot voice technology (Google Text-to-speech) to personalize the visuals and the audio. 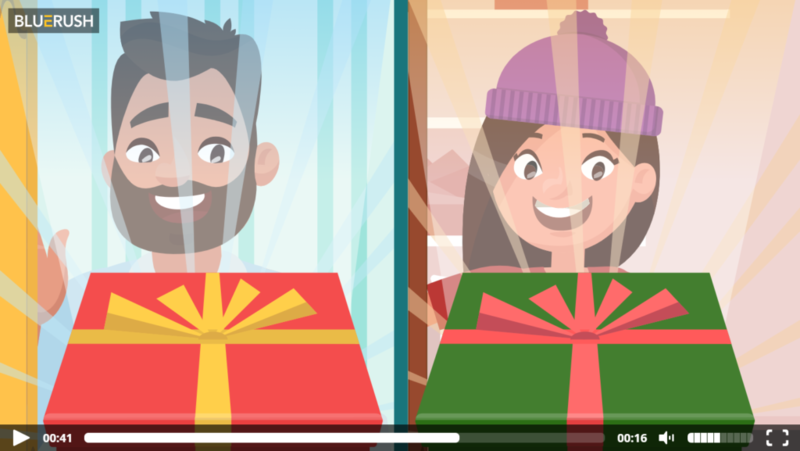 With these fun new features and its inherent power, personalized video proved its value once again in our latest personalized video holiday campaign. Inject our expertise in interactive personalized video into our holiday campaign to create a memorable and engaging experience for valued members of our digital community. We created a fun SVG-powered video template for the holiday season with inputs for personalization (name of recipient, name of sender and wish for the holiday season). Then packaged the personalized video in a well-crafted, simple and sincere email. We identified clearly in the subject line that our email included a personalized video and then we hit Send! The IndiVideo platform delivered individual emails to our contacts. Each message included a link to the recipient’s own interactive landing page and personalized video. As stated in the email subject line, the personalized video was the main attraction, but the landing page provided additional avenues for engagement. Recipients could enter their wish for the holiday season and generate their own personalized video, then spread the cheer by sending the experience on to a friend. Lastly, recipients could select which charity they wanted BlueRush to support during the holiday season. Including a personalized video in our holiday email increased our open rate over the industry average by almost 5x for our campaign. It also increased our click through rate over the industry average by 10x! This strong start continued; 79% of those who clicked through to the video landing page proceeded to watch the video. Not only did these recipients engage with the video, but 62% answered a question for further video personalization. Although requiring more actions from recipients can result in friction during the conversion process, our recipients* were intrigued and saw the value in executing this extra step to reveal more personalized content. This behaviour perfectly demonstrates why personalization is so successful for sales and marketing. An equally balanced exchange of value can create incredible results for your campaigns. *Note: the majority of our recipients are from the financial services sector. Without a doubt, campaigns are significantly more engaging and generate more conversions when communications are interactive and personally relevant. Interactive personalized videos earn more email opens and allow brands to communicate more information to their audience. We saw a great percentage of recipients click through and watch the video but we also saw an increasing number of recipients willing to take the time to answer a question to get a more personally relevant experience. According to an Accenture study, two-thirds of consumers have said they are willing to share personal information if they get something in return and if their data is secure. As consumers acclimate to interactive experiences, we believe this number will continue to increase. Just as we do for our clients, we used IndiVideo to supercharge the typical holiday email and make our message shine. We were able to craft a campaign that was interactive, intriguing and highly personalized... and saw astounding results! Interested in IndiVideo for your own campaign? Contact us.